North Piha Beach, and Kohunui Bay, seen from Te Waha Point. Lion Rock and Kaiwhare Point distant. 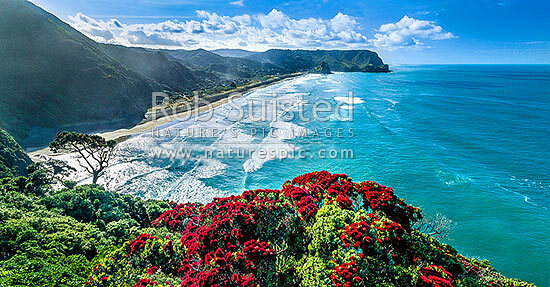 Waitakere Ranges, West Auckland, with flowering Pohutukawa trees, Piha Beach, Waitakere City District, Auckland Region, New Zealand (NZ), stock photo.